Here's my review of the Yamaha Tyros 4 arranger workstation keyboard. This is a professional keyboard; the price alone would indicate that it is not for beginners but for serious, professional players. It sells online for over 5 grand and that's a lot of money to invest in a keyboard. But to be fair, it's value for money. If money is no deterrent this may just be the instrument for you. 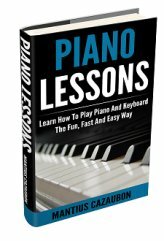 Are you looking for expressive realism in terms of keyboard voice? You will love the Super Articulation voices of the Yamaha Tyros 4. I found that the Choir Voices sound really human, angel-like if you ask me. And what's more is that you can express them however you want on the keyboard. Wind and brass instruments sound like the real deal. You would swear that you were playing the actual instrument. These instruments feature natural legato and stacato expression and you can use them with performance effects like pitch bend, vibrato and glissando to sound like the real thing. There are so many beautifully sounding voices on the Tyros 4. There are 993 dynamic, realistic voices. The keyboard comes with Yamaha's Live!, Cool! and Sweet! voice categories. I really love these voices. They sound like the actual instruments. The Super Mega Voices are also great. If you play a lot of organ, you will like the Organ Flutes section. This section lets you use nine panel sliders to adjust the flute footages. Although I like the additional voices on the Tyros 4, to be quite honest, it's not really a significant improvement over the Tyros 3. But I really liked the simulated instrumental improvements, particularly the human voices. There are three new drum kits on this new Tyros. Real drums, Real brushes, and Drum Machine. These are good kits but since it's an all new instrument I would have liked to see more. As for the new guitars, they're really good. There's 500 built-in dynamic styles on the Yamaha Tyros 4. Talk about a professional-sounding back-up band that you can play along with. I particularly like the guitar parts and how real they sound. The human voices are remarkably real as well. The ability to use SA voices in styles is a plus. I was very impressed with the VH-2 (Vocal Harmony 2) feature of the Yamaha Tyros4. This is a very welcome feature and a great improvement. If you sing and play, you can do it all alone and have your own virtual backing vocalists do the backing up. Plug in your microphone into the keyboard and get ready for harmony. There's 44 vocal harmony presets including male, female and SFX settings. I also loved the vocoder feature. As a producer, I love the fact that the Yamaha Tyros 4 comes with a 16-track sequencer. It's nice to be able to create my own styles and voices as well. In addition, you can make your own audio recordings right on this keyboard, without any separate recording hardware. Compared to the Tyros 3, in my opinion, the Tyros 4 is not a significant upgrade, it's more like an update. If you already have a Tyros 3, there's probably no need to buy this new generation of Tyros keyboards, except if you've got the money and just want a keyboard that is at least a little better. I find that with the Tyros 3 there was so much more improvement over the Tyros 2. With the Tyros 4, there is less improvement over the 3. But I'm not saying that this takes anything away from the Tyros4. The Yamaha Tyros is one of the best arranger keyboards you can find. Overall, it's value for money. Watch this youtube video of the Yamaha Tyros 4. It makes sense to invest in a top of the line instrument. Yes, the price of the Tyros may sound like a lot and it may even be a lot to you, but the level of inspiration you will get with such a keyboard, no figure can be attached to it. When you want a keyboard that can inspire your creativity, consider buying a Yamaha Tyros4 arranger keyboard. Learn more about the Yamaha Tyros 4 or buy the keyboard here. 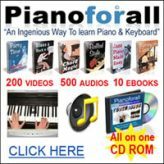 Yamaha keyboard reviews home page.